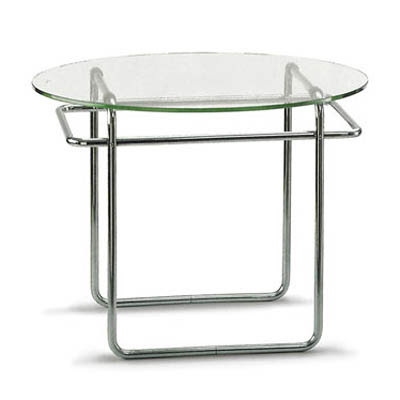 The Bauhaus K 40 table was designed by Marcel Breuer around 1927-1928.
a timeless icon of modern design. "I considered such polished and curved lines not only symbolic of our modern technology but actually technology itself," reflected Marcel Breuer about his celebrated table. Marcel Lajos Breuer (Pecs, Hungary 1902-1981) Hungarian architect and industrial designer, is one of the most significant designers of early Modernism. Trained at the Bauhaus in Weimar, Germany, is heralded as having produced the first tubular steel armchair, his pieces pioneering the demand for tubular steel furniture throughout the 1920s and 1930s. These pieces, along with his innovative laminated wood furniture and his unique architectural interpretation of light and space yielded a great deal of international respect and inspired the work of a wide range of designers. Breuer is seen as one of the forefathers of the energetic aesthetic of uninhibited experimentation, combined with a high standard of artistry, that the design industry enjoyed throughout the second half of the century. Marcel Breuer studied under Walter Gropius at the Bauhaus from 1920-24. During his student years he designed furniture for the Bauhaus model house, and created pieces like the hand-carved "African" throne. Although whimsical and formally a distant relative to his later work, the chair initiated the technique of taut, minimal upholstery that would become one of his trademarks touches. He also designed a solid, blocky armchair for the Sommerfield House in 1921, and a desk chair with a woven, multicolored seat and back. Both of these pieces exhibit a starkly different method of achieving comfort than his later streamlined, even clinical, pieces. When the Bauhaus moved to Dessau in 1925, Breuer designed furniture for the new campus and became head of the furniture workshop, a position that he held until 1928. Also in 1925, Breuer created the famous tubular steel "Wassily" chair, purportedly inspired both by constructivist aesthetics and by the handlebars of his new bike. This piece, made for Wassily Kandinsky's (Russian, 1866-1944) space in Dessau, and referred to by the Bauhaus designers as "the abstract chair," made the user look as though they were floating on the upholstered seat within the steel cube frame. The chair was innovative in that it was extremely light, and was built entirely from ready-made tubes that were welded together. Several different companies sold the piece until it was picked up by Knoll. In 1928 he started a private practice in Berlin and came out with his "Cesca" cantilever chair and stool, named after his daughter and probably inspired by Mies Van der Rohe. He worked with other cantilever designs, exhibiting one of the few couches made in this style at a 1930 show in Berlin. In 1935 Breuer, for the English company Isokon, produced a laminated wood chaise lounge and chair that, although innovative in the way they mimicked the human form, were never made as sturdily as his steel pieces. A 1936 molded plywood chair he made inspired the work of the Eames a decade later and his nested tables revisited the form of some he produced earlier in steel. In 1937 he moved to America and worked as an architect with Gropius in Massachusetts. From 1937-1947 he taught architecture at Harvard, and was commissioned by his former student Eliot Noyes to design buildings for IBM. In 1946 he started his own office in New York City and over the next decade or so, designed and furnished over seventy remarkably similar private houses and college dormitories, for Bryn Mawr and Vassar, in and around New England. His work remains relevant due to his flexible structural philosophy that, "a chair...should not be horizontal/vertical, nor should it be expressionist, nor constructivist, nor designed purely for expediency, nor made to 'match' a table it should be a good chair." Marcel Breuer was born in Pecs, Hungary in 1902. He studied at Allami Foreaiskola, at Pecs, and at the Bauhaus in Weimar where he graduated in 1924. He taught at the Bauhaus in Dessau until 1928 and practiced in Berlin for three years afterwards. After working for one year in London with F. R. S. Yorke, he emigrated to the United States where he worked as an associate professor at Harvard and maintained a working arrangement with Walter Gropius. He operated a New York practice from 1946 until his retirement in 1976. Breuer's early projects in the United States were largely domestic, but in 1952 he worked with Nervi and Zehrfuss as architect for the UNESCO headquarters in Paris. This prestigious work carried his practice into the international field. Breuer's buildings were always distinguished by an attention to detail and a clarity of expression. Considered one of the last true functionalist architects, Breuer helped shift the bias of the Bauhaus from "Arts & Crafts" to "Arts & Technology". Many pieces of modern, tubular steel furniture in use today can trace their origins back to the Breuer experiments of the mid-20's. Marcel L. Breuer died in New York in 1981.